The community of Culver has a history of different names and different locations. Settlers began arriving in the vicinity of Haystack Butte just south of present Madras in the early 1880s. The region became known as the Haystack district. A post office was established at the Elijah Barnett homestead on June 21, 1890, and named Haystack. Mr. Barnett also operated a small store at the site. Orace G. Collver later became the postmaster of Haystack. Mr. Collver moved nearer to Haystack Butte in 1899 and established a small store next to his neighbor, Perry Read. Mr. Read developed a stage stop at his homestead and provided meals and fresh horses. The stage stop became known as Perryville. It was decided that a new post office was needed, and several local settlers names were proposed, but postal officials chose the name Culver, an ancestral name of Mr. Collver. A small community began to grow and included a school, community hall, store and stage stop. It was now on the main stage route, and mail was delivered on a weekly basis. 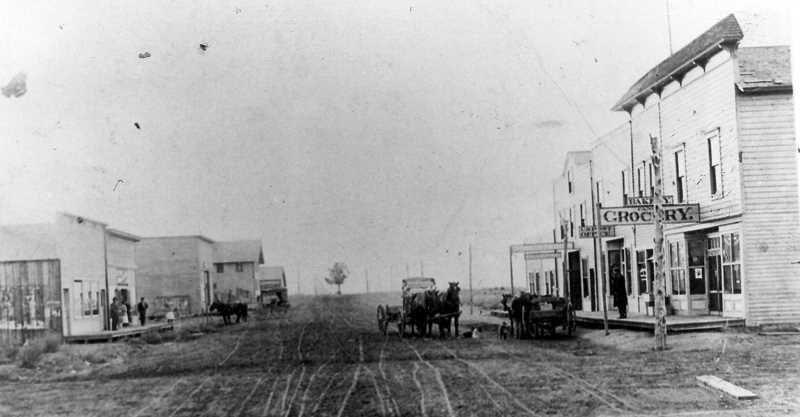 The Culver vicinity began to have an influx of homesteaders after the turn of the century, and it became a busy community. News of the coming of the railroad to Central Oregon led settlers to plan to move the community near the railroad tracks. A townsite company was established in 1910, and a site was platted for the new community. Most of the commerce moved from what became known as Old Culver to the present location of Culver. The railroad arrived in Culver in April 1911. The new community rapidly began to grow. It had a newspaper, two hotels, warehouses, stores, a railroad depot, a church and a drugstore. For a short while, it was known as New Culver. A well was drilled and provided water for the community, and it was no longer necessary to haul water with wagons from spring sites. Later, water was pumped from Opal Springs along the Crooked River. When Jefferson County was created from Crook County in 1914, Culver was selected as the interim county seat for the new county. A building was dedicated for a courthouse, and locals anticipated that once elections were held that the community would be chosen the permanent county seat. But when the first elections were held two years later, Madras was elected the permanent county seat. Many local residents of Culver believed that the county seat had been "stolen," and county officials had to forcefully move county records from Culver to Madras. Culver then became a thriving farming community with a past of many names.